I was lured into buying the newest Ghostbusters game over the weekend, and I've got to say, it's a better game than the last Ghostbusters game that I played. 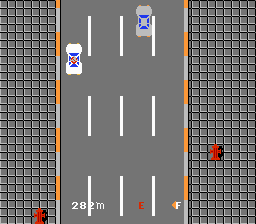 Which doesn't seem like much, I know, but the NES game came out in 1986, so if you're younger than about 24, you might have missed the connection... until now. One of the annoying parts about the first NES Ghostbusters game is the driving portion (the everything else is also pretty bad), but if you absolutely must play it, there is a way to cut down on the amount of time you have to play this game. 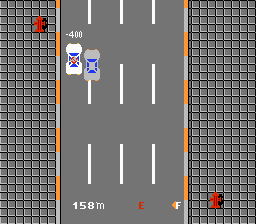 On the driving segments, you can press Up on the Control Pad to drive as fast as possible. Then hang out in one of the corners of the screen. Due to a glitch, you'll actually use slightly less gas at full speed and most of the other cars on the road will sail right by you. But it's close enough for me. The NES Ghostbusters game isn't very good, but that didn't stop me from playing the heck out of it when I was younger. Mostly because I didn't have much better to do. 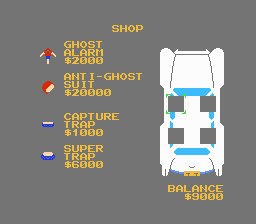 buy the Ghost Alarm for $2000 and sell it back for $3000. Keep doing that until you have all the money you need. But, I didn't have a copy of Ghostbusters to test, so I went out and found the only copy of the game within 10 miles of my house at great personal expense ($3.95 American). I popped the game in and went to work. Then I kept doing that until I couldn't buy anything else, and the game was unwinnable because I didn't have any equipment. But, given the prevalence and specificity of this tip, I'm thinking that there might be some revisions floating around out there that have this bug, but it certainly wasn't in any that I had.